Board Certified Emergency Medicine. General medicine and minor surgery. Originally from Burien, Wash., Dr. Horsley received a B.A. in Zoology from Indiana University and then his M.D. from University of Cincinnati Medical School. He completed his internship and residency in Internal Medicine at San Joaquin County Hospital in Stockton, Calif. After moving to Ellensburg in 1979, Dr. Horsley worked at the Valley Clinic for six years. In 1985, he became the medical director for Kittitas Valley Community Hospital's Emergency Department, and in 1991 he directed the Kittitas County Emergency Medical Services (EMS) Program. He has also served as medical program director and assistant professor of health education for the CWU Paramedics Program. Dr. Horsley is Board Certified in Emergency Medicine by the American Association of Physicians Specialists. We are honored to welcome him to Central's family. Board Certified Family Nurse Practitioner. Provides women's health care, general medical care, preventative health care, mental health issues and sexually transmitted diseases. Board Certified Family Nurse Practitioner. Provides women's health care, general medical care, preventative health care and sexually transmitted diseases. Jack is a Family Nurse Practitioner with experience in women’s health and general family practice. He offers contraceptive care, STD evaluation and testing for women and men, medical treatment for mental health and stress issues, orthopedic care and infection/internal medicine evaluation. Jack spends his leisure time cycling, hiking/climbing, reading and playing the clawhammer banjo. Graduated from Central in 2010 with a BS in biology with a specialization in cell and molecular and minor in chemistry. There after I challenged my test for the MLT certificate and received it in February of 2011. I am still continuing to go to school to get my master's in administrative management through Central. I have lived in Ellensburg for almost 8 years and 2 years ago my wife and I bought a house. We plan to stay here for another several years and hopefully have children one day. I like to be outside working on the yard, except during the fall/winter when football season is on, than it's all about the Seahawks! Patient care, heath education and women's health. I started nursing career in 1975, and have worked in public health, clinic nursing, pediatrics, and home nursing services. I enjoy collecting antiques and art. I also enjoy boating and swimming, motorcycle riding, and occasional calligraphy, making jewelry, and reading. I have a grown son, one cat and a dog. I was born and raised in Ellensburg and love calling it home! I attended CWU and graduated from YVCC nursing school as a Licensed Practical Nurse. I have worked at Kittitas Valley Community Hospital in Med/Surg and OB for 5 years, a family practice clinic for 2 ½ years and with an orthopedic surgeon for 27 years. My husband is also a local and we’ve been married for 38 years. We have a daughter and son-in-law, both graduates of CWU and are teachers on the west-side. I have a collie and two shelties (all tri-color). I enjoy gardening, the Oregon coast, snowmobiling and of course, shopping! I graduated from the University of Washington with a B.A. in English. I then worked as a medical claims examiner for an insurance company in downtown Seattle. I love the city and would often spend my lunch break at Pike Place Market. I eventually started a medical billing service while living in Enumclaw, WA. During this time, HIPAA was made into law and I had to help implement it for my clients. I am now the HIPAA privacy officer for the Student Medical and Counseling Clinic. In 2001, I sold my business and moved with our family to Ellensburg. I became a stay-at-home mom for the next 10 years. During this time, I spent a lot of time volunteering at the local schools and was busy with all the children’s various activities. I eventually decided to go back to school and became an Registered Nurse. During break I am often working at Ellensburg Pediatrics. 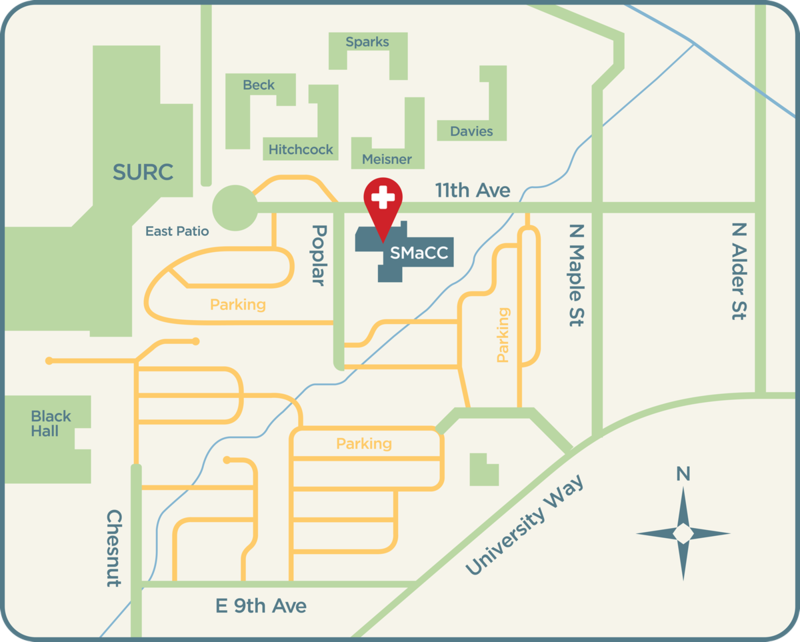 I am currently the pediatric nurse consultant for the Early Childhood Learning Center at CWU. I enjoy watching Seahawks and Husky football, and love going to games whenever possible. Hi! I am Rita Bergevin and I started here in November. I am a CMA/MLT and have 30 plus years of experience working in Family Practice, Lab, and Pediatrics. I live here in Ellensburg with my husband Jim on a small ranch outside of town. Over the last few years, my spare time has been taken up by spending time with my grandkids. There are two more on the way which will make a total of five. I'm very excited to be here!